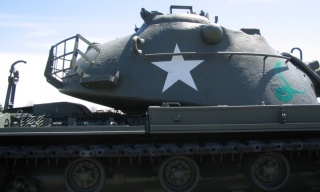 The most successful American medium tank in the immediate post-war period. Development started in 1950. In April 1953, the vehicle entered service. A total of 11,703 vehicles of different variants were produced from 1952 through 1959. 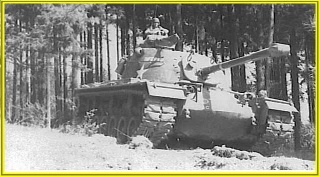 The M48A1 Patton is another example of a jack-of-all-trades-master-of-none tank like its predecessors. It possesses a smooth, egg-shaped hull and a curved turret with decent frontal thickness. Its armor is stronger than most mediums of its tier, though it will not deflect many shots from its peers. 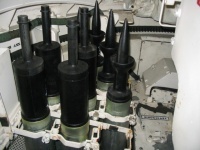 When you get to the 105mm M68 gun, you will find it can penetrate most of its opponents. The 105mm M68 is an extremely versatile weapon, with high penetration, damage, and rate-of-fire. While it is a clear improvement in firepower over the M46 Patton, the M48A1 will face opponents with equal or even superior survivability. It is also slightly slower than its predecessor, due to its heavier weight and weaker engine. 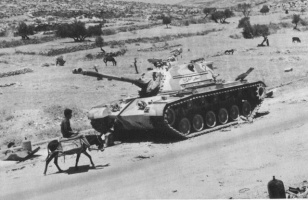 In addition, the M48A1 is also a very large tank, even larger than the T110E5 heavy tank. However, it compensates for that with its reasonable amount of maneuverability and great traverse, at 50 degrees per second. Furthermore, the gun depression is still satisfactory at 9 degrees, though not as effective as the M46 Patton due to its middle turret placement. This makes it suited for close to mid-range combat, darting in and out of cover or a crest, firing shots at the enemy before they can fire back. 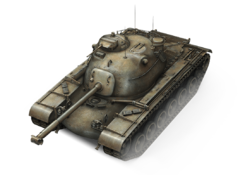 The M48A1 Patton, together with the M60, currently has the best view range in game and should be played with this in mind. At 420m this can be taken above and beyond the 450m hard cap with Coated Optics, which will help negate enemy camouflage. 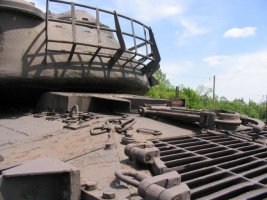 One of the main improvements of the M48 over the M46 is the stronger hull and turret armor. While the armor is enough to bounce lower-tier guns, it should not be relied upon against higher tier opponents. As such, it is a bad idea to think that the M48A1 can emulate the ability of the T29 and T32 tanks to sit and hull down, with impunity. 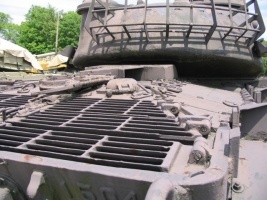 The gun depression on this tank is used to take a shot and then return to cover. Having said that, the turret does offer moderate protection. 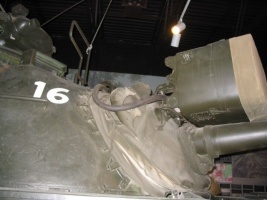 The mantlet acts as spaced armor, although there is a hole in the center with no turret armor behind it. The turret is sloped, thus shots towards its edges may well bounce. 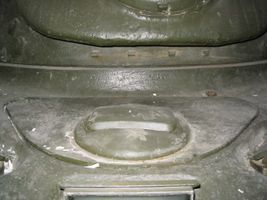 Overall, the turret-mantlet combination offers good protection. Unfortunately, unlike its predecessors, the M48 cannot scout too well. This is because of its larger size, slower speed, worse acceleration, and team value. Still, passive scouting is not impossible, as long as you make good use of the view range. None. The M48A1 comes elite. The M48 Patton is a medium tank that was designed in the United States. It was a further development of the M47 Patton tank. The M48 Patton served as an interim tank in U.S. service until replaced by the U.S. Army's first main battle tank (MBT), the M60 Patton. 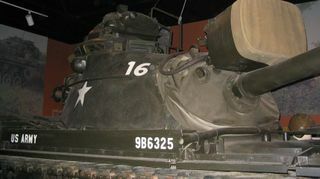 The M48 served as the U.S. Army and Marine Corps's primary battle tank during the Vietnam War. It was widely used by U.S. Cold War allies, especially other NATO countries. The M48 Patton tank was designed to replace the previous M47 Pattons and M4 Shermans. 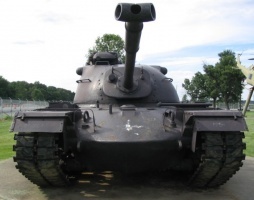 Although largely resembling the M47, the M48 Patton was a completely new tank design. Some M48A5 models served well into the 1980s with American forces, and many various M48 Patton models remain in service in other countries. 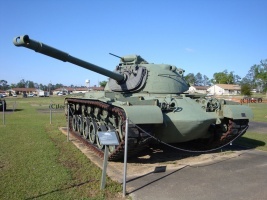 The M48 was the last U.S. tank to mount the 90 mm tank gun, with the last model, the M48A5, being upgraded to carry the new standard weapon of the M60, the 105mm gun. On 27 February 1951, OTCM #33791 initiated the design of the new tank, designated the 90mm Gun Tank T-48 (the prefix letter "T" would be replaced by the prefix "X" beginning with the M60 series tank). A deeper modernization than the M46 and the M47, the M48 featured a new turret, new redesigned hull, and an improved suspension. The hull machine gunner position was removed, reducing the crew to 4. It was essentially a new tank. 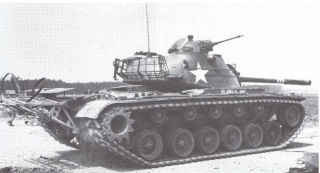 On 2 April 1953, the Ordnance Technical Committee Minutes (OTCM) order #34765 standardized the last of the Patton series tanks as the 90mm Gun Tank M48 Patton. Nearly 12,000 M48s were built from 1952 to 1959. 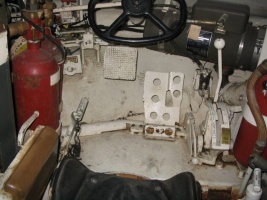 The early designs, up to the M48A2C's, were powered by a gasoline 12-cylinder engine which was coupled with an auxiliary 8-cylinder engine (called the "Little Joe"). The gas engine gave the tank a short operating range and were prone to catching fire when hit. 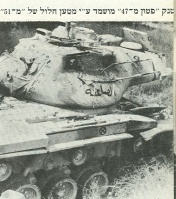 This version was considered unreliable but numerous examples saw combat use in various Arab-Israeli conflicts. They also were prone to fire when the turret was penetrated and the hydraulic lines ruptured spewing "cherry juice" (the nickname for the red colored hydraulic fluid) at high pressure into the crew compartment resulting in a fireball. The flashpoint was too low, less than 300 F, causing many burns and deaths to crew members. 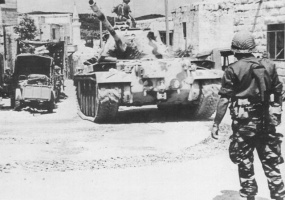 Beginning in 1959, most American M48s were upgraded to the M48A3 model which featured a diesel power plant. 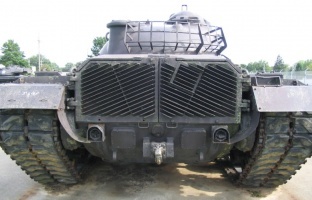 M48s with gas engines, however, were still in use in the US Army through 1968 and through 1975 by many West German Army units including the 124th Panzer Battalion. 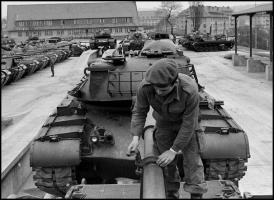 In February 1963, the US Army accepted its first of 600 M48 Patton tanks that had been converted to M48A3's, and by 1964, the US Marine Corps had received 419 Patton tanks. These Pattons were to be deployed to battle in Vietnam. Because all M48A3 tanks were conversions from earlier models, many characteristics varied among individual examples of this type. M48A3 tanks could have either 3 or 5 support rollers on each side and might have either the early or later type headlight assemblies. 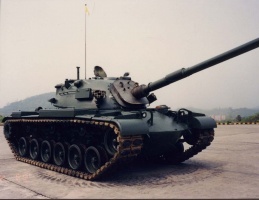 In the mid-1970s, the M48A5 upgrade was developed to allow the vehicle to carry the heavier 105 mm gun. This was designed to bring the M48s up to speed with the M60 tanks then in regular use and to simplify ammunition logistics. 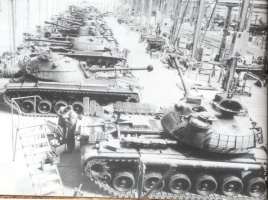 Most of the M48s were placed into service with reserve units by this time. By the mid-1990s, the M48s were phased out of U.S. service. Many foreign countries, however, continued to use the M48 models. With the M47 being only a stopgap solution the M48 Patton was a completely new design compared to its predecessors. 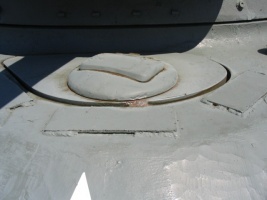 The hull and turret were of cast steel, well curved design and offered much better ballistic protection than former welded and rather flat designs. 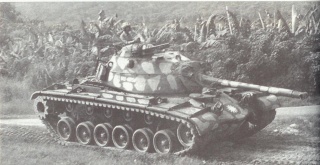 The M48 was significantly larger than any earlier medium tank design. The M48 finally omitted the bow machine gun and gunner. It was armed with a co-axial 7.62mm MG and the commander’s .50 cal MG only. The M48 retained a 90mm M41 gun as main weapon. 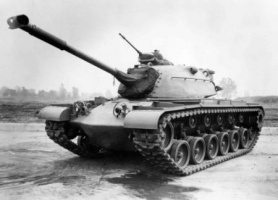 The US Army evaluated the first prototypes in 1951 and production of the M48 began in 1952. Production finally ceased in 1959 with 11703 vehicles being build. The first production M48 can easily be distinguished by the .50cal being mounted on an external cradle without any armour protection. The tank was fitted with an AV1790 gasoline engine giving it an operational range of only 115km. Many of the early M48 suffered from the lack of testing and were not considered fit for service. They were quickly superseded by the M48A1. 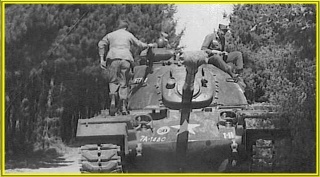 The M48A1 received the M1 commanders’ cupola providing armoured cover and enclosing the .50 cal plus numerous other improvements to the tank. However the M48/ M48A1 was still hampered by its unreliability and lack of range as it was pressed into service due to cold war threats. To overcome the lack of range a system of jettison-able fuel drums was developed. 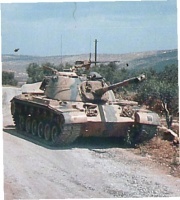 The M48A1 was quickly followed by the M48A2 entering service in 1955 with a new power plant and fire control systems. The M48A2 can be easily distinguished from the earlier versions. It had three instead of five return rollers and a new engine deck without the extensive grille work atop. However it was still powered on gasoline. 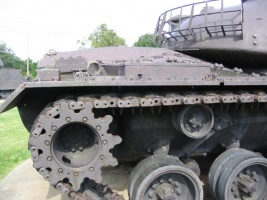 The next step, the M48A2C was a further improved version; externally the only major difference is the absence of the small track tensioning wheel between the sixth road wheel and the sprocket. All M48A2 had a new headlight arrangement, similar to the M60. 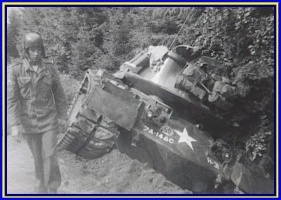 The M48A2C was the last ‘all new’ M48 to be produced, all further versions are rebuilds of existing tanks. Another step further in the M48 development was the M48A3 of 1959, as already stated these were rebuild M48/ M48A1 and possibly a few M48A2. The upgrade included a new diesel power plant, the AVDS 1790 engine, with the necessity for a new engine compartment, similiar to the A2 but with external side loading air cleaners mounted on top of the fenders. Late M48A3 also had a new vision ring for the commanders’ cupola plus a few internal upgrades. The CWS hatch was redesigned, providing more internal space but deleting the two periscopes to the rear. 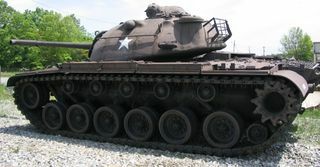 The M48A3 was widely used in the US Army and Marine Corps and saw extensive action in Vietnam where it proofed rugged and reliable. The 90mm main gun was sufficient for the task of infantry support as the Vietnam war was mainly an infantry war due to lack of armoured resistance. The M48A3 performed very well in this role being able to take most mines and even RPG rounds without immediate danger to crewmembers’ lives. Another M48 version used in Vietnam was the M67A2 flamethrower tank. 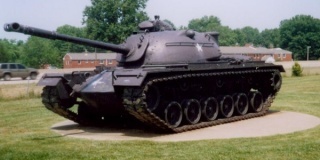 The final US version is the M48A5 of 1975. It incorporates a new main gun, the L107 105mm, two M60D 7.62mm machine guns and new tracks with replaceable octagonal track shoes, the T142 track and a new CWS now close to the IDF ’Urdan’ design as most prominent features. Of course the fire control received upgrades also, most M48A5 also have the lighting system reworked to M60 standard. The rearlights and engine access doors were upgraded, too. The whole M48A5 program nevertheless shows a wide range of actual different conversion status’, some even without the new gun but others with the old M1 cupola or track. 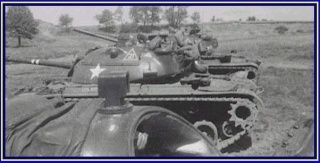 Conversion packs were also sold to other M48 users. The M48A5 has been phased out of any US service by the mid 1990’s. The M48 has seen and still sees a widespread use in foreign service. The first users being allied NATO countries. Major users were Belgium, Germany, Greece, Norway, Spain and Turkey. Other important foreign users are Israel, Iran, Jordan, Pakistan, Taiwan and Korea. This page was last modified on 5 September 2017, at 14:05.